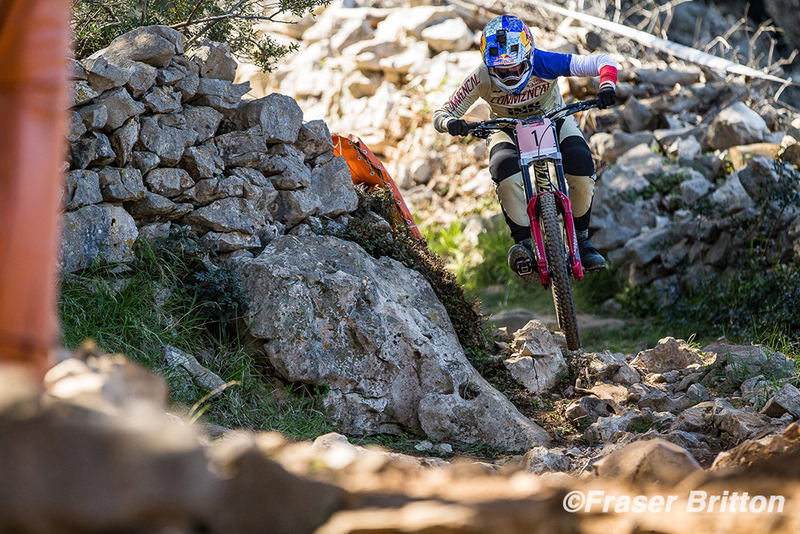 One month after the start of the Cross-country series, it was time for the gravity racers to begin their season for the 2018 UCI Mercedes-Benz Mountain Bike World Cup at the new venue of Losinj, Croatia on the weekend of April 20-22. Losinj is a Croatian island in the northern Adriatic Sea, and is a popular tourist destination. Riders faced a short but demanding course that left no margin for error, with many suffering flats or crashes. The 1300 metre run started with a fast open section at the top of the Sveti Ivan (St John) hill that led into difficult rocky terrain, before spilling out of the woods into the final narrow urban alleys of Veli Losinj to finish at the harbour. Both the women's and men's 2017 overall World Cup winners held onto their Number 1 plates with Myriam Nicole (Commencal/Vallnord) winning for the women and Aaron Gwin (The YT Mob) for the men. Top Canadian for the day was Lucas Cruz in Junior men, finishing fourth and just off the podium. Canada's Miranda Miller (Specialized), the reigning women's world champion, had a difficult weekend, flatting in qualifying and then struggling during her final run to end up 11th. Cecile Ravanel of France set the first sub-2:50 time for the women, before Tahnee Seagrave (Transition/MUC-Off) knocked almost four seconds of the lead with five riders remaining. Two riders later, Nicole demolished that time with 2:40.706. 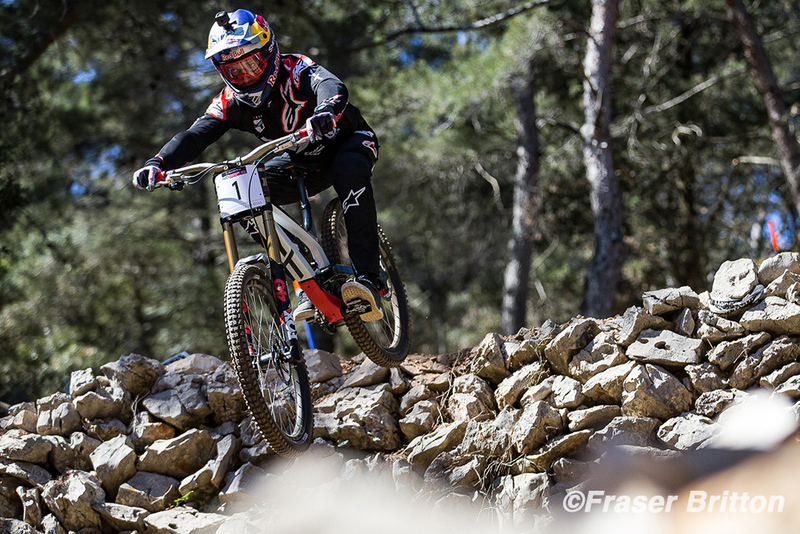 Australia's Tracey Hannah (Polygon UR), the second fastest qualifier, crashed in a rocky corner and ended up tenth, leaving only the fastest qualifier, Rachel Atherton (Trek Factory), to beat Nicole. Atherton was fastest at the first split but then lost time through the technical rocky sections and could only manage second. It was Nicole's fourth career World Cup victory. "I knew it would be hard in the technical part," said Nicole. "My bike is working so good, and we did a lot of testing with the wheels and the suspension to set it up to roll nice on this sort of track. But I have to be honest, this was a really tough weekend. This kind of track is hard to have fun on; there are rocks everywhere, it's dangerous and people getting injured. It's short and a sprint, so you have to be 100%, but I managed to put it all together. It's so good to start the season with a win; I wanted to keep the Number 1 and now I have it again for the next race." The men's race saw American Dakotah Norton (Unior/Devinci), starting 22nd from last, set a time that stood up through all the top riders until the final five began their runs, beginning with Norton's countryman Luca Shaw (Santa Cruz Syndicate), who became the first to go under 2:20 to take the lead. Shaw's time held through the next two riders until defending overall champion Aaron Gwin started with two riders to go. Gwin was fastest at the second split by 1.3 seconds, increasing that to over two seconds by the third split, before losing some time at the bottom of the run to win but hanging on to by 0.798 seconds and take his 20th World Cup victory; only one behind Greg Minnaar's (Santa Cruz Syndicate) record of 21 wins. Final starter Dean Lucas (Intense Factory) of Australia slotted in behind the two Americans in third place. "It was a weird run; I felt weird all week," said Gwin. "It's one of those tracks where you never really feel fast, but the times were good. You have to ride the limit between charging and trying to save your equipment. I had some mistakes, but nothing crazy costly. I knew it would be close and it took me a second to figure that I was in the lead, so it was a close race. 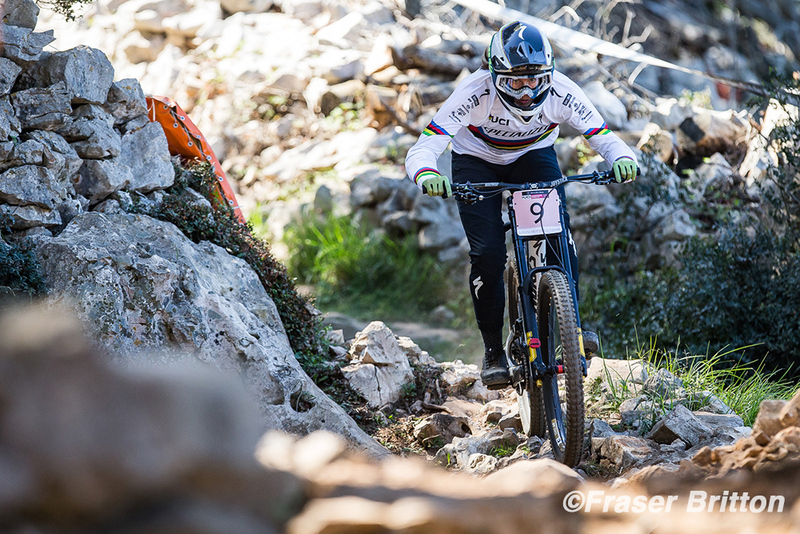 I'm pumped and really happy to be back racing." Mark Wallace (Canyon), who finished eighth overall last year for the World Cup, was the top Canadian finisher in 23rd, followed by Magnus Manson in 30th and Henry Fitzgerald (Norco Factory) in 47th. 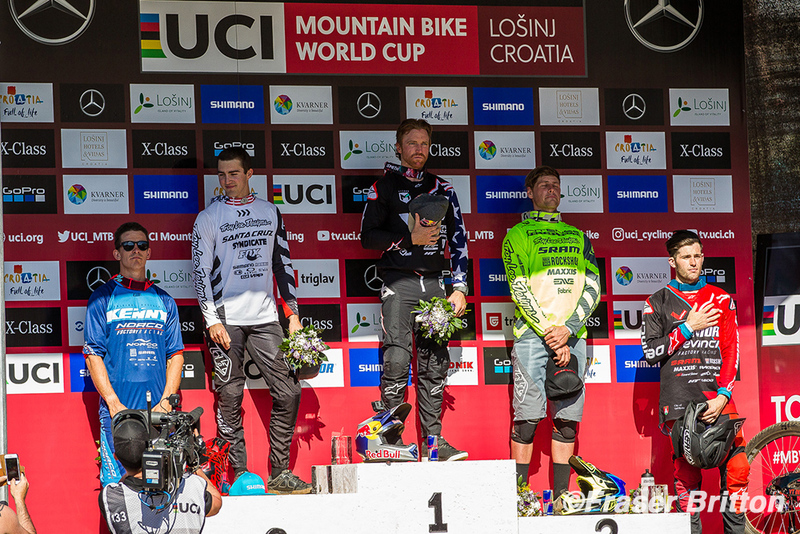 Finn Iles (Specialized), the former Junior world champion and 2017 Junior World Cup champion, was on a strong run in the top-15 until a crash in the lower part of the course dropped him to 56th in the final standings.